Within Teamwork Projects, you can give users administrator permissions at project level. There are times where you may need to make a person an administrator only on a specific project, without letting them change installation settings or other important account settings. The Project Administrator permission type allows you to give an ordinary user administrator privileges on a certain project only. To make someone a project administrator, go to the project's People tab. Hover over the user you want to update, and click the settings cog to the far right. Select the Project Administrator checkbox to enable the permission. 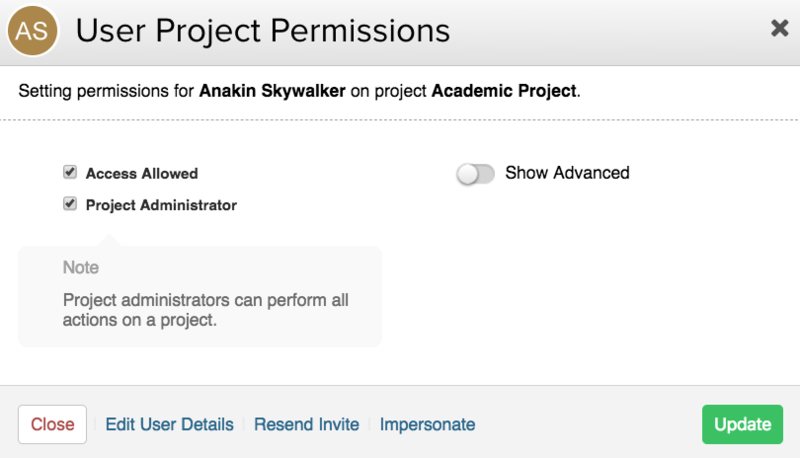 Once you enable the permission, the other permission options will not be available, as project administrators have these enabled by default. If they are in a Client company, they will only be able to add users from their own company, or users from other companies who they already have projects in common with. Note: *The ability to add new users to the account is based on a setting located in the Site Settings > General >Project Administrators can create users. This is set to "YES" by default, if you do not want a project administrator to have this ability, you can change the option to "NO". Note: External company users can see other users on their company so if given permission to add projects, they can invite their colleagues to the project.